It was in the summer of 2000 that I started to confront Hiroshima and Nagasaki as a writer, when I was asked by a Hiroshima TV station to take part in the Peace Memorial Ceremony. Prior to that, I had visited these cities on a high-school excursion and made a study-tour to their interpretive centers, but my only memory of these places was simply that they were fearsome. The Hiroshima I visited this time had been symbolized as HIROSHIMA, and the Peace Memorial Ceremony was more a ritual than a service for the deceased. Coupled with the media's reporting manners, I felt an indescribable discomfort. I wished I could write a novel in touch with the atomic bombing, but it was not immediately possible. My lack of experience with the bomb felt like a wall holding me back. Five years passed before I could finish my book, which I did by hearing from hibakusha, studying history, and so forth. That book is "Bombed Maria," a collection of short stories. The main characters in these stories include students who visited Hiroshima and felt ill after listening to A-bomb victims speaking about their experiences and a daughter taken aback when her father suddenly suggested that she should use the Hiroshima Flame for the candle service at her wedding. They all had had no direct experience of being exposed. In the end, I wound up illustrating the dilemma whereby I was still not able to relate to the bomb. Still, I'll be happy if the people who read these stories are led to think about peace. Triggered by the 1999 JCO criticality accident in Tokai, Ibaraki, I started thinking about nuclear power stations. Until that time, I had thought of them as being a separate issue from the A-bombing. As I became acquainted with nuclear engineers and began studying historical details, however, the two threads became woven into one. It's a fact that high-level radioactive waste will exist for more than a hundred thousand years. For almost forever, we are compelled to live patiently with this radioactive waste as if we were suspended in midair. Humans have been burdened with our destiny: with nuclear bombs and nuclear power generators. These are the walls we face. 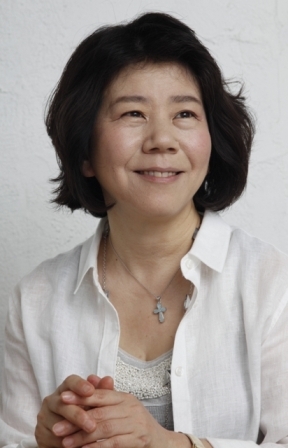 Born in Tokyo in 1959, Randy Taguchi made her debut in 2000 with the full-length novel "Konsento" ("Outlet"). In September 2011, she published "Hiroshima, Nagasaki, Fukushima-Genshiryoku o Ukeireta Nihon" ("Hiroshima, Nagasaki, Fukushima: A Japan that Has Accepted Nuclear Power"), analyzing why Japan has approved the peaceful use of nuclear energy.